First off I think I need to clear something up from my post on Saturday. Today it is windy as all get out and the house is whistling away so I am sitting here thinking no strike that wishing I were someplace warm and calm. This is the best I can do! needed to have some bling on there you know! Both of them said they loved the booklet! Sorry I haven't gotten back to you. I just received the halloween card and i love it!The group must still have my old address , but lucky for me a cousin moved into the house! I was so stocked when I saw it. It's even better in person! 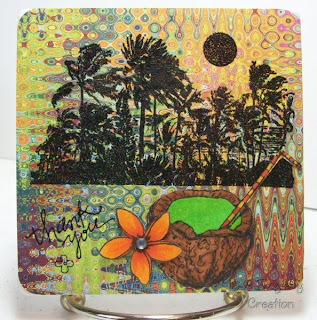 I love your coaster! It really came out nice. I never think oon designer paper. It looks so nice! great coaster, I thought it was a card at first- very fun!